Very often when we do a bathroom remodeling project we're taking out an old 50's through 70's era tiled tub surround. Every time we do we find mold behind the tile. I'm a huge fan of tiling tub surrounds and I always try to talk my customers into tile instead of a fiberglass surround. 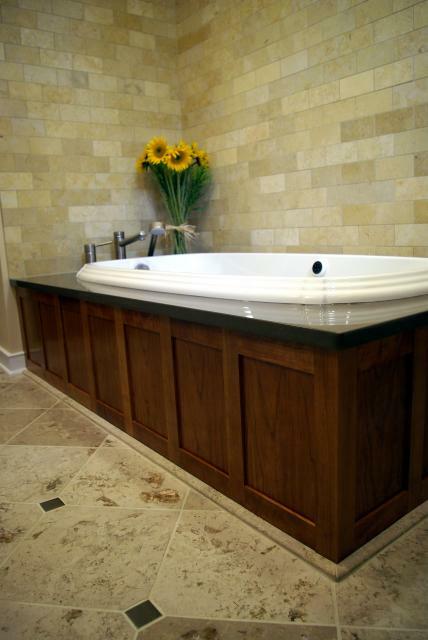 Now, you may be asking yourself, "Why on earth would Owen recommend tiling a tub surround if mold grows behind them?" Common practice for many decades has been to simply tile on top of finished plaster around the tub. Plaster has excellent properties in regard to being moisture resistant compared to drywall, but it still cannot hold up to long term exposure to moisture. Since almost all tile is not waterproof and most grouts as well, moisture is penetrating behind the tile every time it gets wet. Eventualy the plaster or drywall deteriorates and mold growth occurs. In the case of cement backer boards which are touted as "moisture and mold resistant" you'll only get mold inside the stud cavity, on the framing and insulation instead of in the tile substrate. Smart builders started using different types of water and vapor barriers behind their tile years ago, but today there are even better systems available that can be applied overtop of the material you're going to tile over, whether it is moisture resistant drywall or cement backer board. There are waterproof sheet membranes that you adhere with thinset and liquid membranes that are applied with a paintbrush & roller or a trowel. Whether you're doing your own tile installation or having a contractor do it make sure a waterproof membrane is being properly installed behind your tile for a successful home remodeling project! Next post: What Type of Grout Should I Use?